I own model 168 and my rear wheel bracket broken how do I get replacement? Has it's kinks but now I need a charger and cannot find one. I certainly hope that your products have improved a great deal over the years. The one I purchased in 2005 was a piece of pure junk and it finally took a one way trip to the dump. The dealer claimed that the company was bankrupt and he refused to continue fixing it. It was a very, very expensive experience and a complete waste of money. Never worked properly right from the get-go. 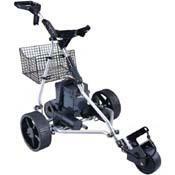 Great cart, I have had mine for 10 seasons. I am careful with it and service it regularly. However, I know have a problem with a stripped gear. It's a great looking buggy but I have a problem as below. please help. I was given this buggy and I love to try it but there is no recharger! Please tell me where I get it. I live in Gold Coast in Australia. Pretty good cart over the last 5+ years. Difficult to find parts when needed. Attempting to purchase a new control box compatible with a Robo 200 electric golf trolley. Any ideas anyone? I purchased my ro250bo 250 about 6or 7 yrs ago: it's been trouble free untill recently: the reestatt control has blank spots in the speed control or will not shut off when speed control is rolled to the off position! it wont stop even when I put the on or switch to the off position !!! the only way i can stop it is to pull out batt pwr cable.i need parts? where do i get them? pls reply urgent. I just purchased a used Robo 200 and the antenna is missing. Can't find a new one. Can you help? It doesn't run. Is that because the antenna is missing? I tried to run it using the on/off switch with the speed turned down, but it doesn't work. I need help! Is Agogos Golf still in business? I need to speak to someone about trouble shooting.